This small, dried, light-colored French bean variety is called the flageolet bean. The word also means delicate woodwind or flute instrument. Leave it to the French to come up with a fancy word that combines beans with tooting. Linguistic inflation is rampant in France. Not that that’s a bad thing. Wouldn’t you agree that flageolet beans sound far more exotic, highfalutin and gourmet-ish than kidney beans? Look at that French country color, they even look snooty. Now that the lowly bean has been elevated in stature, I’m going to throw in a little bioscience and share what actually happens when we eat these little gems. Fancy words or not, indiscriminate digestive rumblings can (and often do) occur after eating beans. Let’s start with the endogenous microbial block party going on inside the large colon. According to National Institutes of Health scientists at the Human Microbiome Project, we have 100 trillion bacteria in our distal gut alone. Beans contain some rather large and unwieldy sugar molecules called oligosaccharides that we can’t easily digest and utilize. We didn’t come equipped with the right enzymes to break down these massive (molecularly speaking) lug-nuts, so instead of being processed in the small intestine as they should be, they bounce their way through the gut relatively untouched and arrive in the colon as an all-you-can-eat buffet for roving herds of bacteria. Imagine a medieval barbarian banquet – a feeding frenzy of gulping, burping and farting bacteria. If you think about it, it’s really not you tooting, it’s the unruly bacteria. So quit blaming the dog (poor guy) and place blame where it belongs. On the gluttonous bugs, their innate behavior and offensive methane byproducts. There’s another thing about beans that has been making the food blog rounds lately. Are they highly toxic if eaten raw? Okay, you’re thinking, who in the world eats raw, dried beans? Well, who eats coins, dead crickets, paper clips and golf tees? If you don’t believe me, I’ll show you an x-ray of my son with a stack of coins in his gut. Kids eat weird things, just ask any ER doc. Raw, dried or undercooked kidney beans contain a toxic compound that can cause severe nausea, vomiting, abdominal pain and diarrhea. According to the FDA, most beans contain this compound, but raw kidney beans contain an enormously large amount. The hemagglutinating unit (hau) is the substance measured for toxicity, with raw kidney beans topping out at between 20,000 to 70,000 hau. Cooked beans contain from 200 to 400 hau. It only takes 4 or 5 raw kidney beans to make an adult sick, so imagine a little kid eating only 1 or 2. Don’t expect your GI doc to know anything about natural plant toxins, so if you call and say your kid is sick after eating one raw kidney bean, he/she will think you’re a nutbar. Or at the very least, an incredibly neurotic mom. In this case, you could be both and still be right. To be on the safe side and to avoid having to explain what phytohaemagglutinin means to an overly busy ER doc, make sure your curious little kiddos don’t stick raw beans in their ears, up their nose, eat them or feed them to the dog. Beans can be enough trouble when they’re cooked, avoid them raw at all costs. 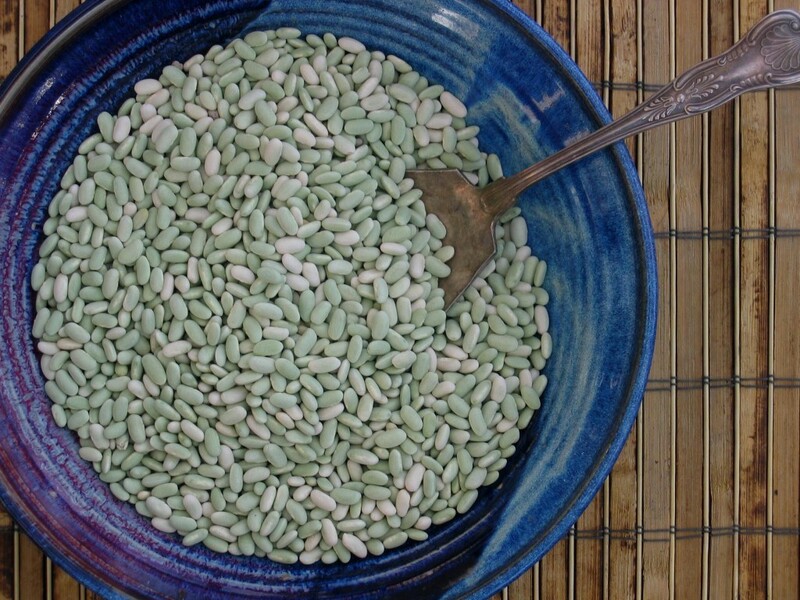 If you’ve read through all this digestion turmoil, you deserve a recipe for flageolet beans. I’ve made them on several occasions and love the delicate, buttery taste. They’re delicious. You can use them in salads, soups or as a side dish. Add roasted tomatoes to the cooked beans and top with a poached egg and some shredded Parmesan cheese. Absolutely divine. Sort and rinse before cooking. Soak beans in cold water overnight (I put them in the refrigerator). Drain and rinse well. Add 4 cups of water or chicken broth for every 1 cup of flageolet beans. Liquid should be 1-2 inches above the top of beans. Bring to a boil; reduce heat and simmer for 1-2 hours. Add more liquid as needed. Peace, love and well-cooked beans!